← How to Backup / Restore your iPhone, iPod, or iPad? While this seems like a simple task to just re-enter all your contacts one at a time manually, if you’ve got a lot of contacts then you are going to waste a lot of time. The initial iPhone running under IOS version 2 didn’t have an import feature, but all new iPhones have the import SIM contacts feature. Go to “Settings” >> “Mail, Contacts, Calendars” >> scroll down until you see “Import SIM Contacts” then click that button. This will import all your SIM contacts to your contacts list in the iPhone. The contacts on the iPhone are stored in internal memory and not on the SIM card. 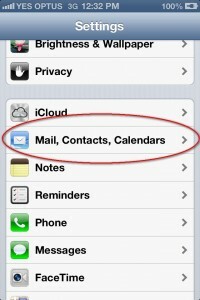 If you wish to move your contacts from your iPhone to another device then the process is a bit more involved. This entry was posted in How To's, iPhone and tagged contacts, iPhone. Bookmark the permalink.